'There is tremendous pressure that says – let's boycott some of their factories,' says MK Porush. MK Meir Porush (United Torah Judaism) said Thursday on hareidi Kol Barama radio that he is under “tremendous pressure,” as he puts it, to call for a hareidi boycott of factories in Judea and Samaria, similar to the boycott of Judea and Samaria by the European radical leftists. “I say – I do not know if this matter will remain under control,” he warned. “The pressure is tremendous, but for the time being, I am preventing it." 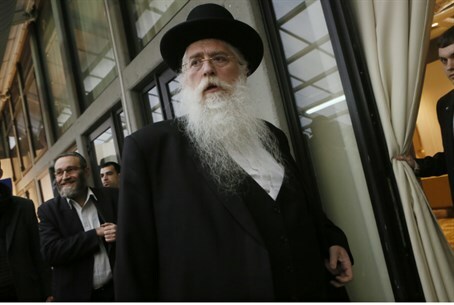 The reason for the hareidi vengefulness Porush described is the anger with the religious Zionists, for their part in the crafting of a bill that is intended to force most hareidi men to serve in the military, or alternative national service – taking away the exemptions that currently allow most of them to study in a yeshiva instead of serving the state. The bill was drafted by a committee headed by MK Ayelet Shaked of the religious Zionist Jewish Home party. MK Moshe Gafni, also of UTJ, was interviewed on the show as well. He noted that the hareidi parties had achieved some successes in the drafting of the law by the Shaked Committee. "There is a process here, in which hareidi Judaism achieved extraordinary success,” he exulted. “The hareidim succeeded beyond all predictions."